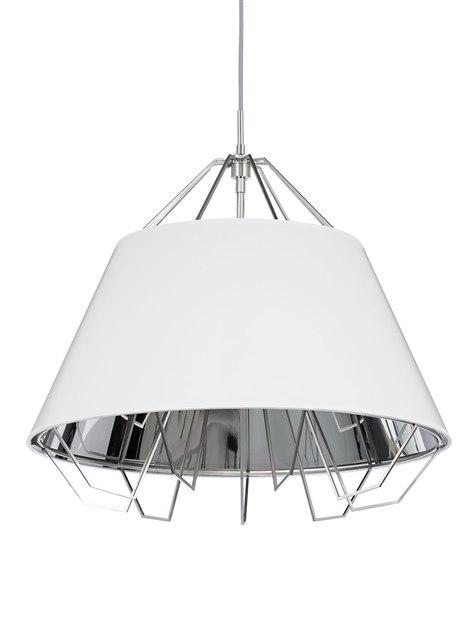 The sculptural metal frame of the Artic Pendant by Tech Lighting will truly transform a space with its sleek and modern design. The arms elegantly represent the path the light is taking. The sculptural high-gloss metal frame features several elegant arms that represent the path the light is taking from the concealed lamping. The semi-translucent shade allows light to playfully bounce around the fixture and enables just a hint of the light source itself to shine through. The scale of this piece will truly transform a space, with a length of 18.9” in length and 22” in diameter, the Artic is an ideal piece in a dining room setting, living room setting or family room lighting, no matter the space this fixture will make a modern yet sophisticated statement. Available lamping options include energy efficient LED or no-lamp, leaving you the option to light this fixture with your preferred lamping. LED lamping option is fully dimmable to create the desired ambiance in your special space. Black, satin nickel, and white finish options ship with satin nickel canopy and hardware. Rated for (1) 60w max, E26 medium base lamp (Lamp Not Included). LED includes (1) 120 volt, 8 watt medium base 3000K LED PAR 20 lamp. Fixture provided with six feet of field-cuttable cloth cord. Dimmable with most LED compatible ELV and TRIAC dimmers.